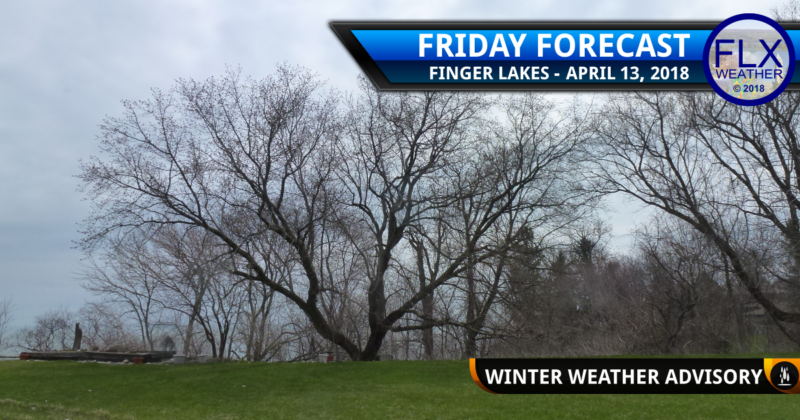 A warm front will lift north into the Finger Lakes today, but not everyone will get into the warm air. All of the Finger Lakes region is starting the day on the cool side of the front, but even early this morning, temperatures were in the 60s across western Pennsylvania. Temperatures will be warmest further south on Friday. Click the map to enlarge. Some scattered showers north of the front dot the region and will continue to do so through the morning. Gradually, most of those showers should shift to the north as the front pushes into the region. Some sunshine may come in and out of the clouds, especially for areas further south. Temperatures will only rise slightly north of I-90 with most places seeing upper 40s for highs. Meanwhile, across the southern ends of the Finger Lakes and across the Southern Tier, high temperatures will push into the 60s. The difference between the warm and cold air will be sharp, so if the front makes it even a bit further north, more areas could see the warm air and vice versa. The front will sag back to the south this evening with 40s overspreading the entire region. Rain showers will drift back into the region as well. Showers will become more numerous through the day on Saturday as the front continues to move southward. Most areas will fall into the 30s during the course of the day on Saturday, with only areas across the Southern Tier near Pennsylvania holding onto the 40s. Given the strength of the April sun, even obscured by cloud cover, I believe most areas will stay above freezing during the daylight hours with precipitation falling as rain. Once the sun begins to set, sub-freezing temperatures will spread from northwest to southeast and precipitation will turn to freezing rain. Several tenths of an inch of ice may accumulate on trees and wires. Gusty winds near Lake Ontario will enhance the risk for power outages in those areas. Much of the Finger Lakes should see at least some freezing rain Saturday night and early Sunday. Significant ice accumulations will be possible and an outright ice storm is not completely out of the question. Confidence in how this evolves and exactly how much ice will manage to accumulate is still low. At this point, it is not unreasonable to prepare for significant icing and potential power outages while hoping temperatures are a degree or two too warm for major problems. Any ice that does accumulate should melt fairly quickly Sunday as the front moves back north. The warm air will be limited in comparison to today, but low 50s are a reasonable expectation across most of the Finger Lakes. For areas near Lake Ontario, Sunday will be the warmest of the next three days. Precipitation should move back north and much of Sunday will be dry with some breaks of sun. Gusty southeast winds will develop late in the day as low pressure approaches. An area of heavy rain, wind, and possibly some thunder will slowly move through the Finger Lakes Sunday night into Monday. With some areas seeing an inch of precipitation on Saturday, Sunday’s rainfall of 1-2 inches could flash flooding problems, given the intensity of the rain. Winds will also continue to increase, especially over Central New York, where 50 mph gusts are possible. Lastly, temperatures will fall from the mid 40s Monday morning back into the 30s by the afternoon. Higher elevations, especially over Central New York, could see a light accumulation of snow. It isn’t too late to contribute to the Fund Drive! Your support is always appreciated and will help Finger Lakes Weather continue to grow! You have chosen to donate $30.00 monthly. I’m supposed to be travelling back to Moravia from Burlington VT on Sunday. They have a winter weather advisory from tomorrow they Sunday at 8pm. Do you think I should cancel my trip? I think you should be OK traveling. Things may be a little slick early on, but temperatures will warm rather quickly as you head southwest.